The global carbon cycle can be described by a box model of the surface reservoirs of carbon and the mantle reservoir. 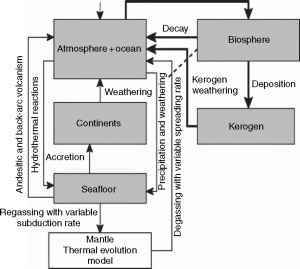 Figure 2 denotes the most pertinent fluxes between the storage of carbon in the mantle, the combined reservoir consisting of ocean and atmosphere, the continental crust, the ocean crust and floor, the kerogen, and the three different biospheres. The efficiency of carbon transport between the reservoirs takes into account mantle de- and regassing, carbonate precipitation, carbonate accretion, hydrothermal reactions at mid-ocean ridges, decay of dead organic matter, and weathering processes. The Earth's crust contains the carbon storage of the continents, kerogen, and the ocean crust and seafloor. Biomass is accumulated from the atmosphere by photosynthesis. A fraction of the dead organic matter is buried in the kerogen pool. Additionally to these direct effects of the biosphere on the surface reservoirs of carbon there is an indirect effect due to the increase in weathering rates denoted by the dashed arrow in Figure 2. Figure 2 Box diagram illustrating the basic mechanisms and interactions of the global carbon cycle. Gray boxes are the surface reservoirs of carbon. The fluxes from and to the different pools are indicated by arrows. Bold arrows denote fluxes affected by the biosphere.